Meet the next generation of professional TriCaster systems. The new lineup of professional TriCaster systems incorporates sweeping advancements in switching, mixing, recording, playback, automation, scan conversion, still-store, CG, virtual sets, visual design, encoding power, and more—enough to replace entire production suites in a fraction of the space, and to double or triple the capabilities of any live production. 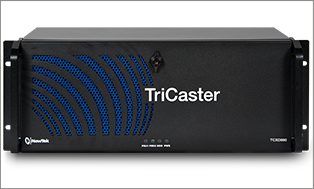 Built for performance, rigged for power, and sized with the capacity to add new shows, take on more clients, create more programming and broadcast, project or stream it live, TriCaster 855 is a complete, integrated solution to deliver big, creative productions, meet tough customer demands and stand out from the competition. An integrated solution for live production and streaming, scaled for booths, studios and vans to reach your audience anywhere. Multi-camera production, native HD, and the world’s most powerful switcher effects system make TriCaster 455 a turnkey live production solution for smaller shows making the biggest impact from any location. NewTek has posted a new pre-release update on LightWave 10. NewTek has released a video showing off the awesome tools coming in LightWave 10. NewTek shares some of the new benefits of LightWave 10 in a video hosted by the Vice President of 3D development, Rob Powers. In today's business environment, are you concerned with loosing your job? Scripture states, "He who tills his land will have plenty of bread..." (Proverbs 13:11 NASB).